Here are some photos of inside and outside our church building. Our church exterior from the parking lot. 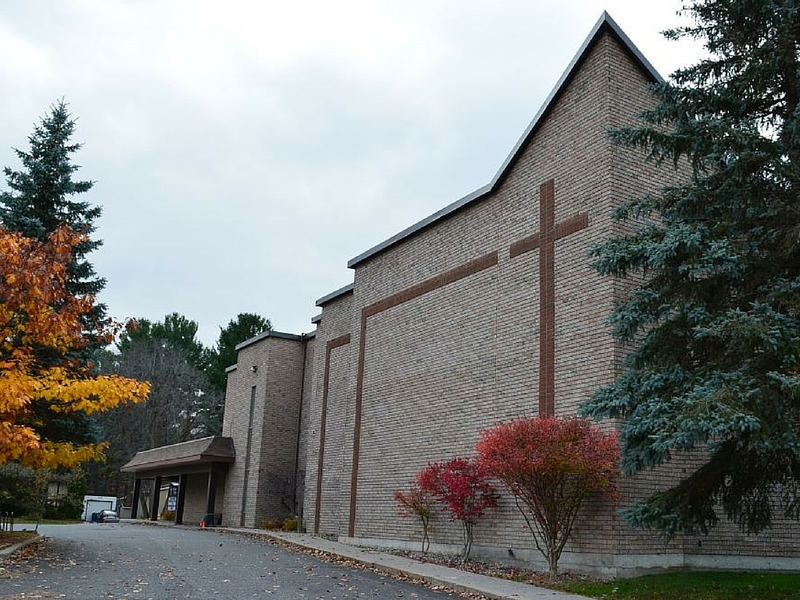 Our church exterior. The doors on the right are the ones most often used during the week. Our front doors (facing McClellan Rd) aren't often used during the week, but are open for Sunday mornings. The entrance most used is the one facing our parking lot. Our side doors (facing the parking lot) are the ones that are most often used. The entrance to our Youth Centre around the other side of the building. On CATALYST nights, this is the entrance to use. Our welcome centre in the lobby is the place to stop by if you're visiting with us for the first time or would like more information about anything that happens at Arlington Woods. A view from the stage shows the entrance to the sanctuary along with our balcony seating. Our fellowship hall is used for luncheons and social events and doubles as a gym for kids and teens. Our nursery features two large rooms full of toys, two bathrooms, a kitchenette, a change table, and a room with cribs and rocking chairs. Our kids ministry centre is a great open space with lots of adjoining classrooms. Our children's library is open to all in our church and community. We have an extensive collection of great books and DVDs for kids as well as resources for parents. Our set-up at CATALYST youth. Couches for conversation in our youth centre. Games tables in our youth centre.